The Sea Screamer is second to none when it comes to seeing dolphins up close and personal! Our vessel puts out a large wake that dolphins LOVE to play in, sometimes only a few feet behind the boat! 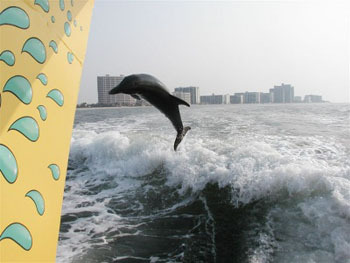 No other boat gives you the excitement of a thrill ride AND an up-close dolphin encounter in one fantastic ride! There is no better way to enjoy these magnificent creatures in their natural habitat, guaranteed or your next trip is free!